Looking for a review that is no longer here? A lot of the old reviews (over one year old) have been moved to the Archive Server. A regular subscription to the site is required to see the old reviews. Click HERE to signup. If you are already a member, you can upgrade HERE. TAC 67 Disassembly pictures and commentary. 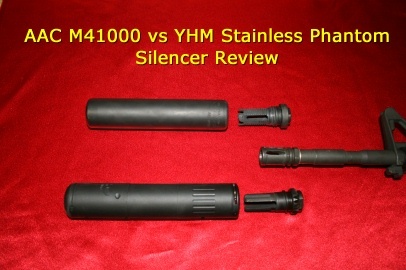 This now discontinued model silencer has one stainless steel blast baffle followed by 4 aluminum baffles. Both end caps are threaded to allow complete disassembly by the end user. 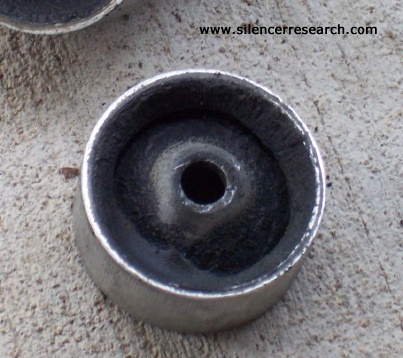 The baffles used in this silencer are the ported "K" baffles. The pictures here are indicative of around 1,700 rounds fired from a fully automatic M16 22LR conversion. Click the picture. 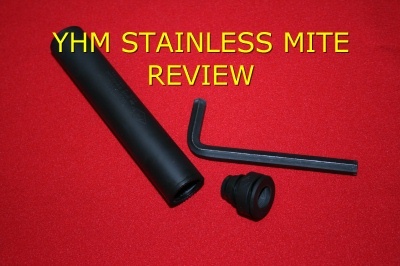 This review is only of the silencer internals. The Tac 67's sound levels are reviewed separately here. John Norrell Arms, Inc. Custom Silencer. This large 22 can was built by John Norrell Arms, Inc. as a custom project. The criteria were excellent suppression coupled with a longer cleaning interval and extra weight to help control muzzle flip. 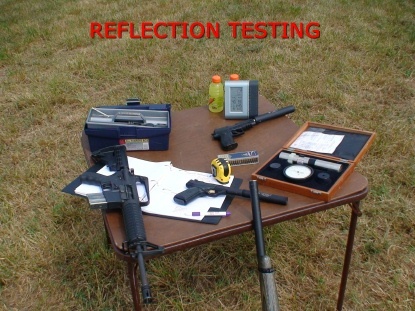 The cleaning pictures that are located in the subsequent page show around 5,000 rounds of fully automatic fire from an M16 22LR conversion. These baffles are "M" baffles. 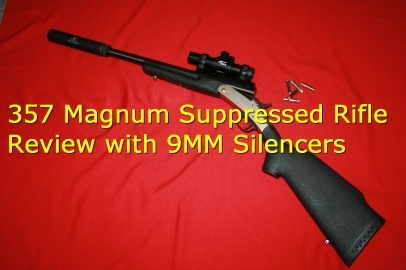 This silencer might be one of the largest 22LR silencers in existence. Click the picture. LRM 169 vs Gemtech Talon w/Trinity. 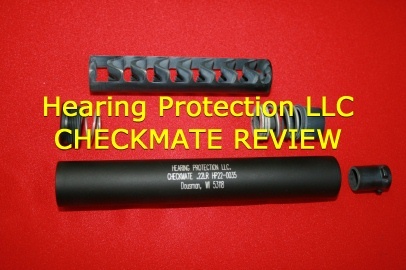 This review of two 9mm uppers for the M16 platform include pictures, ballistics, and some videos. 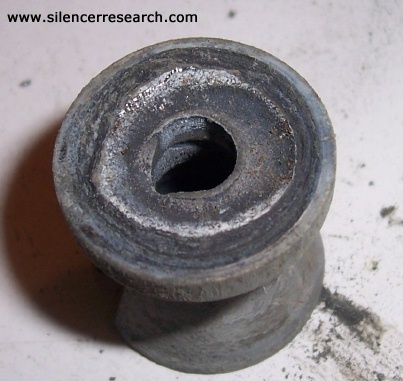 Videos of silencers are deceiving as they don't adequately represent the way a silencer sounds in real life. 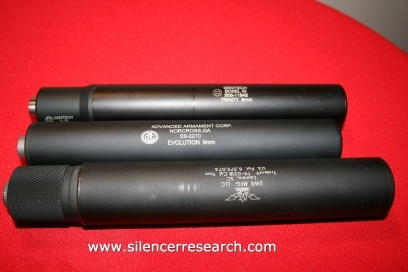 One of the goals of Silencer Research in the future is to make realistic videos that more closely replicate the sound of real suppressed gunfire. 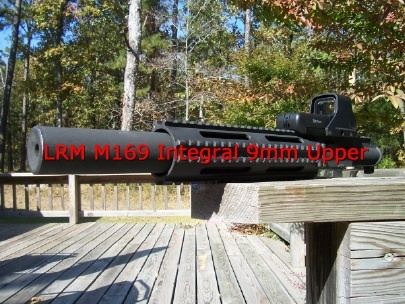 The LRM 169 is an integral upper for the M16. The Gemtech Talon upper is a non-integral upper for the M16. The Gemtech Talon upper is designed to be fitted with a Gemtech Trinity 9mm can. The Gemtech Talon requires the use of 147 grain ammunition in order for the velocity of the projectile to remain subsonic. The LRM 169 does not require the utilization of 147 grain "subsonic" ammo. One can shoot almost any type of regular 115 or 124 grain 9mm ammo and the M169 bleeds off the gases to make the round subsonic. Click the picture. This isn't an official sound test, and was done long before I started this site. 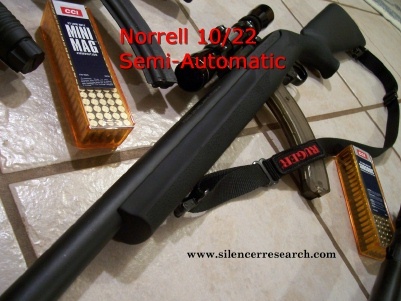 The John Norrell Arms integral silencer. I tested 5 types of high velocity ammunition for both dB and ballistics/velocity. Here is a picture of the weapon. 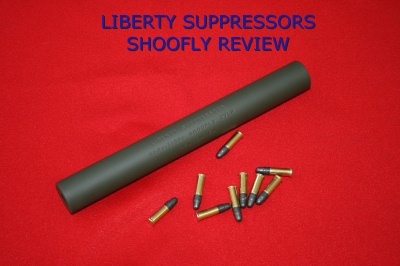 I have fired at least 12,000 rounds of CCI Minimags through this suppressor. The ammunition produces very consistent velocities and seldom causes any cycling problems. I loaded an Eagle 30 round plastic magazine with 15 rounds and fired the weapon to test for dB levels as well as the velocities. Click the picture. 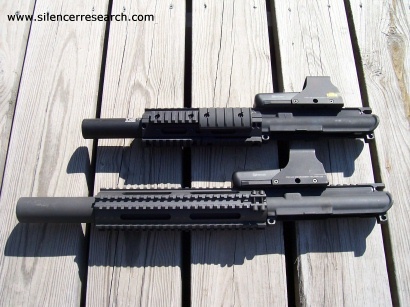 I performed a short test to see what Tactical Solutions barrel was quieter, as well as compare other features and options when using the Tactical Solutions barrels. 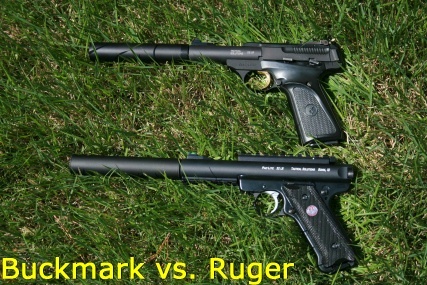 The Browning Buckmark uses the Trail Lite barrel and the Ruger series uses the Pac Lite receivers. Both are high quality products with pros and cons. 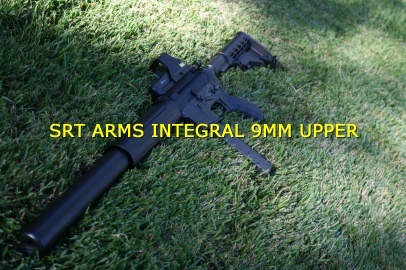 The Tactical Solutions aftermarket products greatly reduce the weight of the factory guns. I believe they also increase the accuracy. 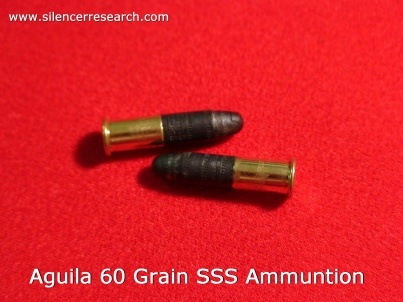 Aguila 60 grain Sniper SubSonic ammunition. The round appears to be a 22 short case with a long 60 grain lead round in it. The extra weight (50% heavier than a standard 22 long rifle 40 grain round) is a first in the rimfire realm. Being 50% heavier, the bullet would seem like a good choice for hitting your target harder and remaining very quiet. The round will NOT stabilize from a normal 22 barrel that is one in sixteen. The Aguila 60 grain round needs the faster twist rate of one in nine. Click the picture. 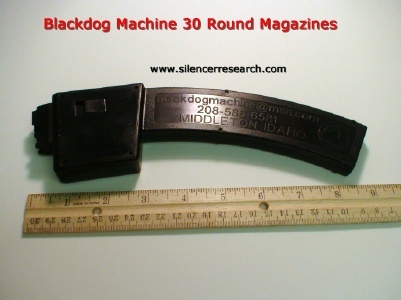 I purchased a Black Dog Machine 30 round magazine recently and gave it a try in my registered receiver M16 kit. My M16 22LR has been heavily modified to work reliably. I use a spring that I acquired from Lakeside Machine and cut it down so that it would run the CCI Minimag 40 grain round reliably. I further installed a ball/detent system into the side of the bolt and rail system of the Ceiner kit to ensure proper lockup and eliminate light primer strikes. To insure even smoother operation, I installed a Wolff extra power hammer spring in my lower receiver BACKWARDS as well. Read more, click on the picture. 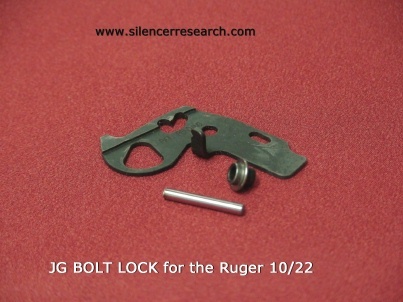 The JG Bolt Lock is a drop-in bolt locking mechanism for a Ruger 10/22 rifle. I reviewed this locking system on May 19, 2007. I tested sound reduction both with and without the bolt lock engaged and I tested both an integrally suppressed 10/22 and a factory 10/22 with a Tactical Innovations 16.5 inch threaded barrel fitted with the AAC Prodigy silencer. 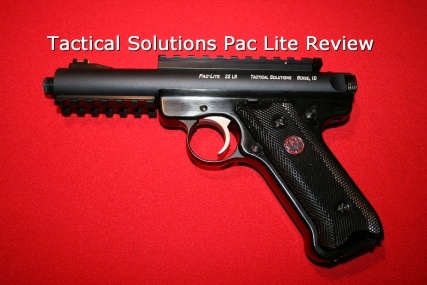 I reviewed the Tactical Solutions Pac Lite. The Pac Lite is an aftermarket replacement receiver for the Ruger family of semi-automatic 22LR pistols. The receivers are all aluminum and are machined from a single piece of solid aircraft aluminum. They are very lightweight. The barrels are chrome-moly inserts.